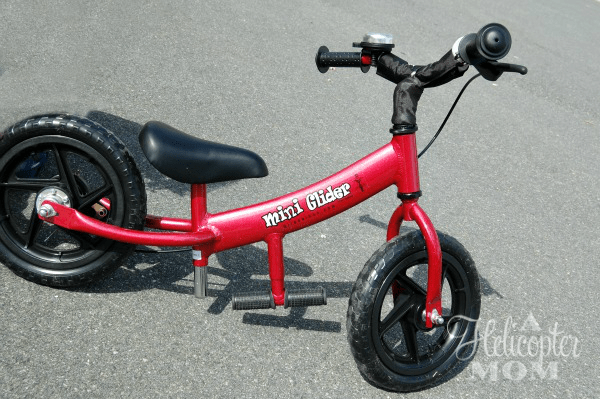 Welcome to the Glide Bikes Mini Glider Giveaway! This is the perfect bike for your little one to learn to ride on! The lower center of gravity on the mini Glider allows your child to balance at a lower speed, making it easier to learn how to balance. Young children can walk themselves along until they’re able to balance and the comfortable enough to glide along. And the mini Glider grows with your little one, so your child can continue to use it until age 5. Check out the awesome bikes at Glide Bikes and see which ones are perfect for your kids! Read the review at A Helicopter Mom to see how her son liked the mini Glider. We want to give you a chance to win this awesome mini Glider for your little one! To enter, use the Rafflecopter Form below. Open to Residents of the US, 18 years and older. Giveaway ends on April 8, 2013 at 11:59pm EDT. I would give it to my cousin’s almost-4-year-old daughter, Brooke. My daughter who will be 2 soon! I have 3 toddler boys at my house that would love this! I would give it to my great grand child. I would give this awesome item to my daughter!!! For my almost 3 year old granddaughter, Amelia Marie!!! If I win, this will be used by all my grandkids (5 kids 6 mo – 4 yr) whenever they come over. We have at least 1 of them here every day (built in babysitters .. hehe) and don’t have a bike for them and the battery powered car we have is getting old fast! I would save it for my 7 week old daughter! This will be for my 4 and 6 year olds to share and pass down. That would be perfect for my daughter. This glider will be for my little guy. my daughter would absolutely love this!!!! My great nephew would love this little bike. My littlest guy just turned 3 so I’d give it to him! I’d give it to my three year old son. My friend’s little boy would love this. I would give it to my granddaughter Olivia. My nephew for his birthday! I have so many little ones that I know, it’ll be a toss up who gets to use it. I would LOVE to give this to my son who is having a birthday on Thursday. He will be turning 3! I would love this for my granddaughter!! If I won this mini glider bike I would give it to my first foster child. I was blessed to have him in my home for 11 months. He is now 4 years old. I am very thankful that I have been able to continue to be a part of his life. He is a wonderful kiddo who has had a very unstable home life for the last 3 years and deserves so much more. I would love to give this to my 3 year old daughter. My daughter who will make her arrival in August!! My youngest son who is currently 14 months. My 3 year old daughter would love this! Thanks for the chance! I would give this to my son kyson!! My neice ! For her 4 year old daughter that has brain cancer. !!!!!!!!! My 6 year old would LOVE this glider!!!! My daughter. She’d LOVE it! I would give it to my two year old! Would make a nice birthday present for my son! I would give this to my 3 kids to share. my son, he would love this! I will give it to my 2 sons, 3 1/2 and 2. My 4 and 7 year olds will fight over this! I would give this to my daughter for her birthday. 🙂 Her bike is starting to fall apart! My four year old Madelynn!! I would love to give it to my grandson. he will only be a year old in May so it would be a bit before he could ride it. My son, he turns 2 on April 10! I’d give it to my great-niece! Would give it to my grandson. I haven’t seen him since he was 2 only pictures. He will be 8 his next birthday. He would love this. For my son who will be 2 in a few months. I would give this to my great grandson. My grandson would love to have this at grandma’s house. I would love this to be able to have it in my living room to show it off to everyone. I love all of the canvases on the site.